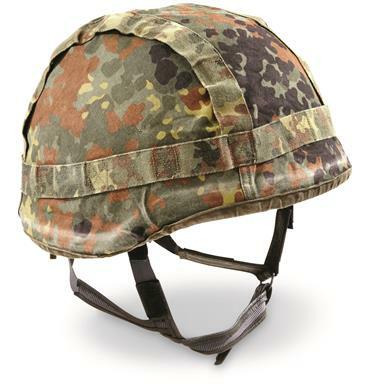 Rely on this genuine NATO Helmet to ward off gonks and bonks and protect your noggin from flying debris. It's ready for extended duty! NATO Military Surplus Flecktarn Camo Helmet with Kevlar, Used is rated 3.4 out of 5 by 22. Rated 2 out of 5 by Mike111 from Not great Ordered 4 of these two are ok. The shell is very worn with chips and paint is gone on some. Two of the covers fit and the other two would fit a different helmet. The suspension is not good but it was supposed to be decorative but too bad the covers are hit and miss. Rated 5 out of 5 by Jayci68 from Incredible price and high quality! I have purchased kevlar helmets in the past (from other surplus retailers), but none of those were as great as this helmet from SG. The kevlar had no cracks, the liners and chin straps are in perfect condition as well as the helmet cover. It's as if I got a brand new piece of equipment that came right off the assembly line. Rated 4 out of 5 by Buzzsaw from Good Quality Cost Effective Kevlar Helmet It's a very affordable kevlar helmet that arrives in good condition. They must have smaller heads over there than here, because some were way too small even adjusting beyond intended strap length, but others fit just fine. That's the only complaint. I like the flecktarn cover as well, and you can always bleach and dye if it doesn't go with what you have. I like the cover on the sides as well. It protects the ears and side of the face unlike the new designs, yet does not obscure hearing. It does not go down quite as far as the older American designs. Rated 2 out of 5 by Roger from straps not functional I ordered two of these helmets. The chin straps were not the same. The attaching to the helmet was not the same. Both chin straps were not functional. Rated 5 out of 5 by Cordy from Better than expected! My complete order arrived in four days. After reading some of the other comments, I was a little concerned about what condition it would be in. I was pleasantly surprised to see that it was very acceptable for a used helmet. No damage to the helmet, normal wear on camo cover, as pictured in description. Also liner and chin straps were all there & not damaged, rusted, and operable.Luck of the draw ? I am pleased with the one I received.Sportsman's Guide club price, no tax & free shipping added up to a very good purchase for me. Rated 1 out of 5 by Steve from Junk I bought 2 helmets #1 the Kevlar top was literally crushed/smashed in about an 1 1/2" and the straps were rusted, rotten and not complete. #2 Kevlar was ok but the head piece was flaking apart (made a big mess) and missing most of the strapping. I have ordered several items from SG and have always been happy with their items but very disappointed with these. After reading other reviews I took a chance and got bit. I sent them back and hopefully they will make it right, with decent helmets this time.. SG really needs to take a quick look at these before they ship them out..